Let your little one join in all of the bike riding fun with the Eggy! 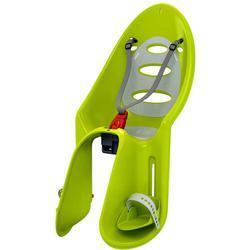 This rear-mounted child bike seat is perfect for the adventurous child. With it’s unique egg shape, the Eggy will be the child bike seat that keeps kids safe, while turning heads. The unique design of the Eggy keeps kids comfortable and safe while enjoying their ride. Ventilation holes are built into the seat to keep little one cool on a warm day. The seat is also strategically covered in thermorformed padding that is removable, water repellent and weather proof. An adjustable 3-point safety harness keeps little one secure and snug. The footrests are designed to adjust to 8 different positions to accommodate growing children. Safety straps are included with the footrests to prevent contact with the wheel spokes. The Eggy is available in three different color combinations: Black & Grey, Aqua & Grey and Lime Green & Grey, ensuring a look that is perfect for anyone. Once the mounting bracket is installed on the bicycle, getting the Eggy on is a breeze with the One-Click installation system. Attaching and detaching the child bike seat can be done quickly and will allow the rider to embark on their journey in no time. The Eggy will fit bicycle frames from 28mm to 40mm (1.1in - 1.6in). A modern suspension system will give kids a smooth and easy going ride, even over rougher terrain. ONE-CLICK INSTALLATION - An innovative installation system makes attaching and detaching the child bike seat to the bicycle frame quick and simple. FITTING - Can be installed on bicycle frames from 28mm to 40mm (1.1in - 1.6in). ADJUSTABLE FOOTRESTS - Eight position adjustable footrests lets the Eggy grow with child. COLORS - Available in Black & Grey, Aqua & Grey and Lime Green & Grey.